Growing up in Vermont, Morgan Jennings ’08 was always interested in science. Still, when he enrolled at Wheaton, he was unsure whether to pursue it as a major and a career—until he took his first class with Professor of Physics John Collins. “Getting involved in the Physics Department there really sold me on it. J.C. made physics a lot of fun,” Jennings said, using Collins’s universal nickname among his students. “He’s just a super relatable, easy-to-talk-to person.” It’s a sentiment heard frequently among current and former students about Collins, who is now in his 30th year teaching at Wheaton. Physics, the study of matter and energy, takes its name from the ancient Greek word for “knowledge of nature,” and that reflects what attracted Jennings to the subject. Sometimes it would take him 12 hours to finish a take-home physics exam at Wheaton, but at the end he felt satisfied knowing he had solved all the problems on the test. Today, Jennings is putting that dedication to work as the product manager at SciAps, a 5-year-old startup based in Woburn, Mass., northwest of Boston. The company makes advanced hand-held devices that can measure the elements, minerals or compounds inside a physical object, whether a rock or a piece of scrap metal. Its key customers include companies that buy and sell recycled scrap metal, which use the devices to determine a metal’s value, and mining and exploration companies, which use them to understand the chemistry of what they find underground. While Jennings was one of SciAps’ first employees, it now employs about 65 people, and he no longer is the only one from Wheaton. Working with referrals from Collins, Jennings has brought on board three of his fellow physics graduates: Bert Marston ’10, Colin Nygren ’15 and Ryan Clair ’16. Initially, Jennings wasn’t sure how he would use his physics degree. “I came to really love the science when I was at Wheaton, but I still didn’t know what I wanted to do with it,” he said. Soon, though, he found a job as an application scientist at Innov-X Systems, another Woburn company that made analyzer instruments. It was a good fit, and he wound up staying at the company for five years. Then in 2012, Sackett—who had hired Jennings at Innov-X when he was its CEO—left the company and started SciAps. He quickly decided Jennings would be an asset as he and his co-founders worked to get the new business off the ground. devices. The instruments “zap” objects to measure their elemental contents, with one line using X-rays and the other two using lasers. A customer can point one of the SciAps analyzers at a piece of metal or a rock, and within a few seconds it will report the concentrations of the elements inside—with no need to send samples back to a lab for tests. Jennings’s responsibilities include supervising several employees, including Nygren and Clair, who provide technical support to SciAps sales staff in the field as they demonstrate products to customers. Jennings also travels to visit key clients himself, and serves as an intermediary between customers and the engineering team. Jennings credits Wheaton with teaching him not only science but also the other skills he uses at SciAps. “In business, you’re only as good as you can communicate your ideas,” he said. Of course, work isn’t Jennings’s entire life. When he isn’t at SciAps, he’s usually home with his wife, Samantha Murray Jennings ’08—who works as a project manager in the operating room at Massachusetts General Hospital—and their infant daughter, Molly. Jennings started his unofficial second job as an employment agency for Wheaton physics majors in 2010, when Collins reached out to see if he could help find an opportunity for Marston, who graduated that year. Jennings secured Marston an interview at Innov-X. possibility of switching from a large employer to a startup. By the time Marston arrived at SciAps, Jennings already had hired two other Wheaton graduates. The first was Nygren, who as a junior approached Professor Collins, his advisor, for help with career opportunities. Collins put Nygren in touch with Jennings, who secured Nygren an internship at SciAps during the summer of 2014. Jennings and his colleagues were so impressed with Nygren’s work that they offered to hire him when he graduated the next year, and in the meantime kept him on as an intern for his senior year, during which he developed a laser technology that served as his capstone project. He now works directly for Jennings as a product specialist, serving as the technical expert who answers customers’ questions about SciAps devices. In November 2016, SciAps gained its third Wheaton employee with the hiring of Clair, another former Collins student. Clair was friendly with Nygren, who reached out to him when Jennings needed to hire another product specialist. Clair believes a well-rounded education, including an intensive focus on writing, is crucial for success working in the sciences. “You don’t just need to know the math; you need to know the rest of the human skills,” he said. Back at Wheaton, Collins is grateful that the effort to build lasting bonds in the Physics Department has paid off. “The goal is to keep this rolling, keep the connections real, keep everyone interested and enthusiastic and working for one another,” he said. 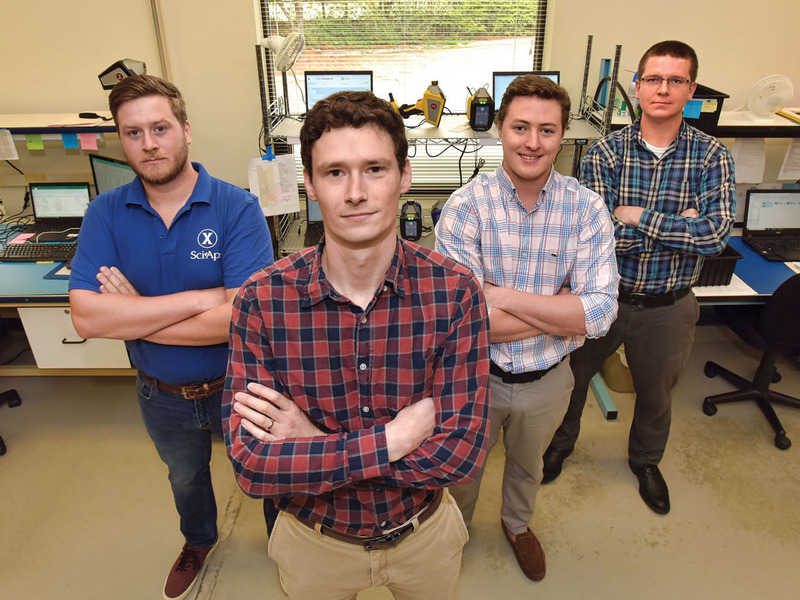 The four alumni working at SciAps are not Wheaton’s only connection to the company: the college also has purchased two of its devices for use in academic research, including on a recent faculty-led trip to Iceland. In May 2018, a dozen students traveled to the North Atlantic country for a study abroad program organized by Professor of Geology Geoffrey Collins and Associate Professor of Chemistry Matthew Evans through Wheaton’s Center for Global Education. The two-week summer course—cross-listed in the physics and chemistry departments—brought students to one of the world’s most unique geological landscapes to give them hands-on experience with field research. Students planned their own projects, and many decided to conduct research using a newly purchased SciAps instrument called a field-portable X-ray fluorescence spectrometer. The hand-held device shoots X-rays into a rock or other object, then analyzes what it finds and provides a breakdown of the elements inside. The machine has been dubbed “the rock zapper” by students. One participant in the trip, Shiva Carter ’21, used the spectrometer to conduct research on the catastrophic 1783 eruption of Laki, a volcano in Iceland. Wheaton has bought a second handheld SciAps instrument, a laser-induced breakdown spectrometer. It uses a high-powered laser to vaporize a microscopic portion of whatever object is being studied, then analyzes the cloud created to produce a breakdown of the elements inside. 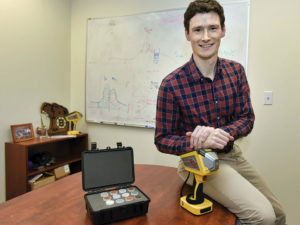 Collins secured a deal to purchase both devices through two of his former students now working at SciAps, Colin Nygren ’15 and Ryan Clair ’16, and enjoys peppering them with questions about the machines.